DaCapo “Chiaroscuro” concert next week! Return from the Big Apple! Back from New York City! Took in the musical "The Fantasticks," ate brunch at the great jazz club "The Garage," and feasted my eyes (if not my ears) on Birdland, The Blue Note, and the Village Vanguard, just to name a few. So much fun! I am travelling to New York City tomorrow! Can't wait to be back there-- "the city that never sleeps!" I am going to see one of the longest running musicals Off-Broadway, The Fantasticks, and hope to visit a jazz club or two! Can't wait! Check out a batch of new photos that were just uploaded! Head on over to the Photos page. Enjoy! Hi everyone. A concert I was involved in today with the talented Cher Farrell and the great folks at Glen Morris United Church raised $3000 for ALS research! I felt very privileged to be a part of the event today! Hey everyone! I will be performing tomorrow night at 8:30 at Maxwell's Music House as part of their Open Mic Night called "Act 5." Gonna break out the 'torch singer' in me with "The Man That Got Away." Come check it out! Should be a fun evening with great music. Hi everyone! I'm currently in the process of booking venues to perform in KW. Stay tuned for updates and thanks for visiting! 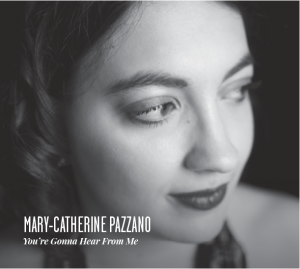 Thank you for visiting the personal website of Mary-Catherine McNinch-Pazzano, jazz and classical soprano vocalist. We're a work in progress here, so please bear with us as we add more content to the site.